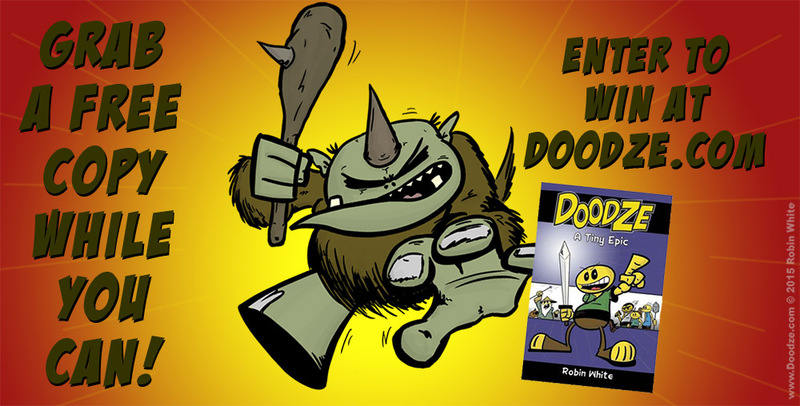 Doodze — A Tiny Epic » Archive » UPDATED (8/3) Enter to Win a Free, Signed Book & Sketch! I seen it on twitter. I will check out what I can find about Doodze(looks pretty cool 😎) as I read and collect comics. Hope to win. THANKZ! Tried to enter the contest using my own email rather than the Facebook login, but when I clicked the link to leave a blog post comment, I got an XML document back with an “Unauthorized” error. At any rate, I’ve been reading the comic for a while, and I honestly can’t remember how I found out about Doodze; I’m pretty sure I got linked here from another webcomic artist. I found out about the contest from Twitter; I started following you while reading the comic. Tremendous, Robin! You do great stuff! Good stuff Robin. Congrats on the book. I’m looking forward to reading the graphic novel!